August 20, 2011 by Alphageek in "alphageek", "review", "urbanspoon"
8/19/2011 I am going to start with a simple lead in: any restaurant that is growing herbs in the parking lot deserves a look. That's right, as we drove in, we noticed that they were growing herbs right there in pots around the back of the building. 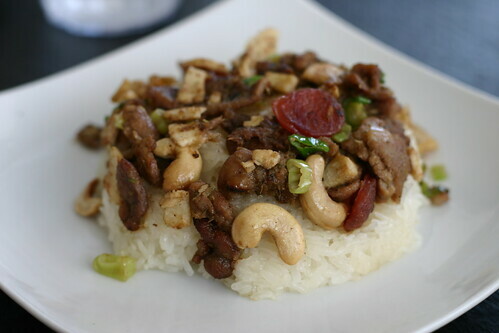 Below is some glutinous rice with grilled meat and cashews. This was a great dish to get things going. 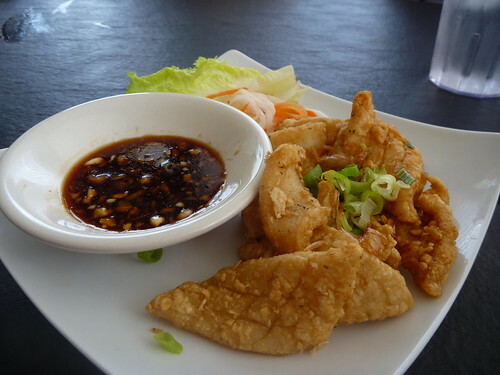 The Crispy Calamari, below, was expertly prepared. Usually, the alphageek does not like the chewiness of calamari, but this dish was not at all chewy and had a meaty taste. 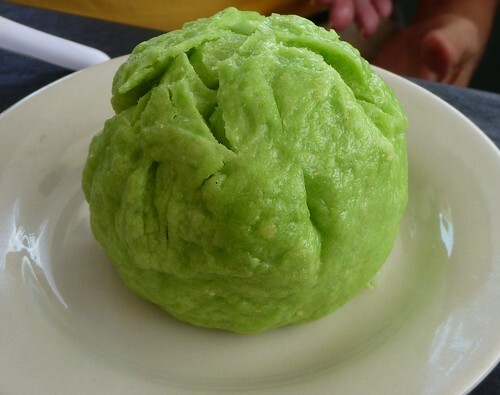 The Steamed Pork Bun is pictured below. It is a little unpretentious presentation of a steamed meal in a bun. The first surprise is there is an entire egg within, steamed right inside. The package contains an entire meal in there. The native name is Banh Bao Hea. While one might think this is a St. Patrick's Day dish, but this is how Mekong Restaurant serves this one up. 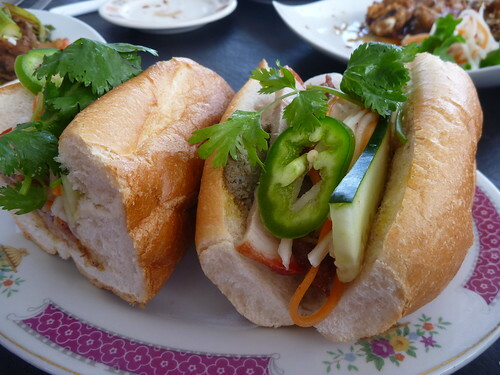 Below is Banh Mi Dac Biet. We will just say it is a sandwich. It has lots of fresh herbs, as well as grilled pork and sort of a liver pate on it. The french bread helped set the dish in the extraordinary category. One has to wonder where they get their bread, and can we get some there? The final dish is rice fettuccine with veggies and meat. 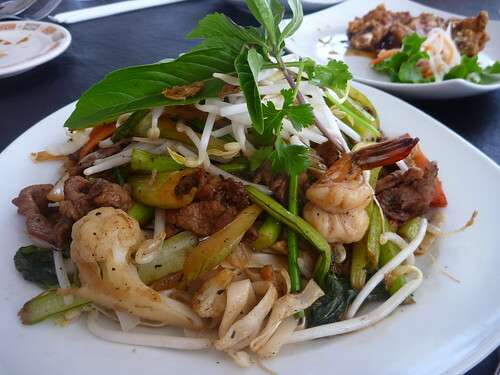 This dish is a balance of fish sauce and soy sauce to lightly season and bring together all of the ingredients. The dish is a generously large serving for one person, so either bring a friend, or get a to go box to enjoy the leftovers later. So, you are now asking, what about those herbs you mentioned? Well, we walked outside after the meal and took a look. There were pots with many assorted Asian herbs such at Thai Basil and lemongrass. They incorporate a system of rotation that was illustrated by the varying ages of the plants. 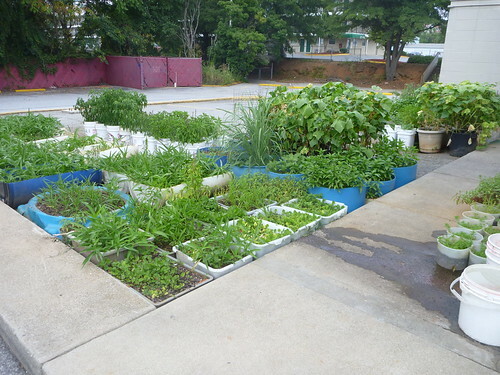 I have to recommend any restaurant that grows their own herbs for use in the restaurant. Don't ask me what all of the herbs were, because they push the knowledge of even the alphageek. You can take a look below, and see if you can pick out anything you recognize.